I know in national politics, Fridays are supposed to be quiet days where the media is preparing for the weekend, and so a story that you want to receive far less attention than normal, you release on a Friday afternoon or evening. Hopefully by Monday the country has moved on from your potentially negative story. Under the Trump administration it seems like the President doesn't understand this dynamic and somehow imagines that if news is released on a Friday it will get more coverage, because it is an exciting night of partying. 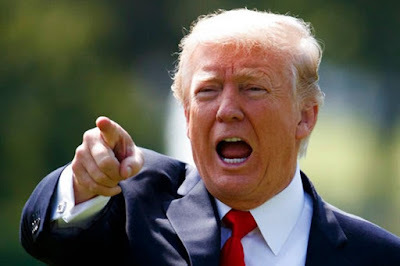 Last week Trump once again redefined political wisdom or convention by, in the middle of hurricane preparations, released a huge number of news, that left the media gasping to figure out how to cover it all. Here are some snippets of that epic Friday news dump. 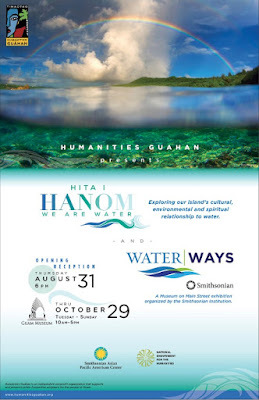 Independent Guåhan (IG) continues their efforts to educate the island community about the possibilities for Guåhan should it become an independent country, with two educational outreach opportunities in the last week of August. The first, a village meeting, will take place at the Dededo Senior Citizens’ Center on Wednesday, August 30th from 6:00 -7:30 p.m. The second, the latest in their monthly General Assemblies (GA) will be held on Thursday, August 31st from 6:00 -7:30 p.m. at the main pavilion of the Chamorro Village in Hagåtña. Both events are free and open to the public. Meggai malago' yu' bei sångan put si Donald Trump yan i sinangån-ña (yan håfa ti ha sångan lokkue') put i nina'triste giya Charlottesville. Fihu ilek-hu na ti hongge'on i bidadå-ña si Trump. Ya siempre ti siña ha ikak este na malabida pat este na eskareng. Lao atan ha', kulang un chatpago yan sen mutong na fafa'tinas milagro este na taotao. Sigi ha' ha na'långga yan na'manman yu', kada simåna. Meggai malago' yu' na bai hu sångan, lao ti nahong i ora på'go, guaha meggai otro cho'cho'. Lao este ha' malago' yu' na bei ensima gi kombetsasion. Guam gets its 15 mins of national or international media fame refreshed every few years, sometimes because of a typhoon or earthquake. Sometimes because of snake epidemics. 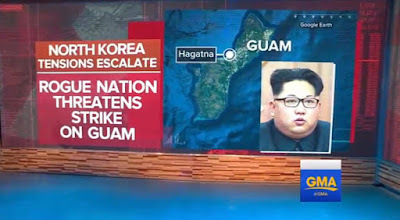 Over the past few years, North Korea has had alot to do with Guam getting a little extra attention. Usually these periods are frustrating to analyze in media terms because Guam, even if it is mentioned as the focus of a story, still remains at the periphery of it. But this most recent North Korea scare led to a series of well-written and insightful articles that didn't shy away from Guam's colonial status, but engaged with it. Here below is probably my favorite piece to come out from all the drama. 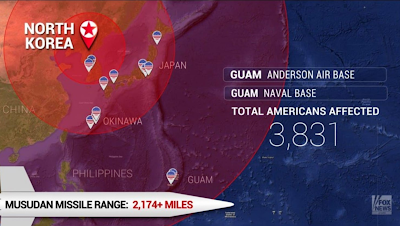 "Guam: A colonized island nation where 160,000 American lives are not only at risk but often forgotten"
The past few days have been quite hectic due to the threat to Guam by North Korea and President Trump's shocking response. 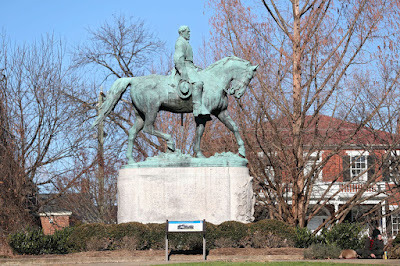 I am trying to catch up on my posts on this blog, and so we'll see if I'll be able this month. Here are a few articles on the initial threat from North Korea to Guam. SEOUL/GUAM (Reuters) - North Korea said on Thursday it was completing plans to fire four intermediate-range missiles over Japan to land near the U.S. Pacific island territory of Guam in an unusually detailed threat that further heightened tensions with the United States. 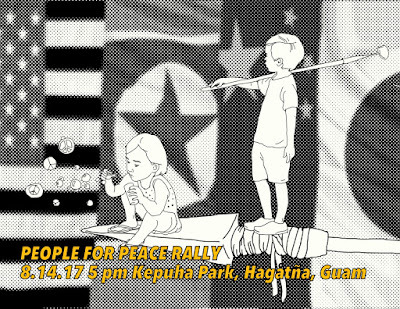 Hagåtña, Guåhan — In a call for peace amid dangerous talks of war, two Guam community groups are organizing a “People for Peace” rally at the Maga’låhi Kepuha loop in Hagåtña on Monday, August 14, 2017 at 5 p.m. Independent Guåhan and the Prutehi Litekyan/Save Ritidian organization are inviting the local community to join them with peaceful signs and positive messages they’d like to share with the world.